Choose your ink quantity, then download and complete the appropriate Order Form for the ink brand to your right. For small quantities, proceed to Option A. For larger quantities, proceed to Option B. Choose a color label from the 6 designs shown below. Customize with stock logos and/or personalized information with a black imprint. The label will be applied to a white, Groove Grip™ bottle according to ink type. 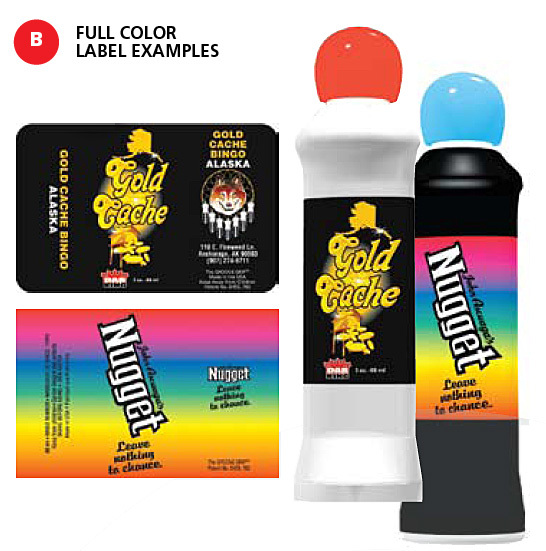 A 4 color label will be custom designed by our artists to your specifications. The label will be applied to a white, Groove Grip bottle according to ink type. Please ask your customer service representative for more details.